Both Nina and Papa got back to business really quickly after the wedding. Poor Nina having the lazy trait gets really bothered by doing too much housework. Well, it aint gonna do itself! At this point I realise that Nina is actually part of a known family to The Sims franchise. Not bad, Papa, not bad. Her surname Caliente means hot in Spanish, referring to both her temper and her saucy figure. She indeed has both Spanish, Arab and alien ancestry. 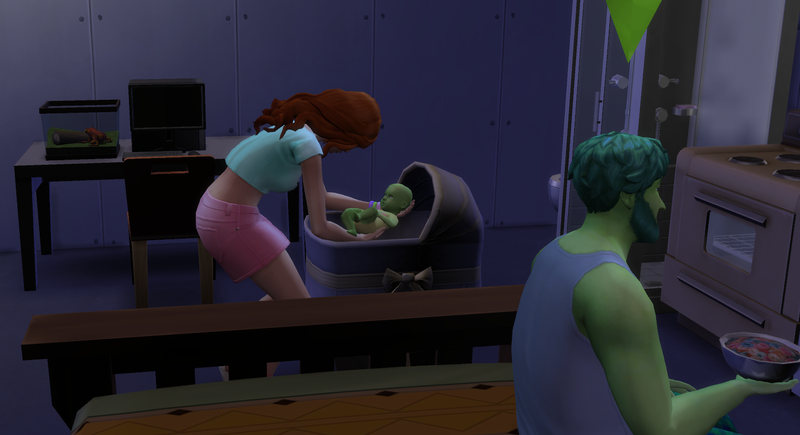 Thankfully, the steamy wedding night resulted in a little sprout, as Papa might say. Crop top and high heels! Chief of mischief returning home! Papa and I were both extremely excited to learn that the first born was indeed GREEN! Huge relief! Other challenge players, I’ve seen, have not chosen very restrictive heir criteria. There’s a risk I might not make it all green till generation 10. It was a girl and she was named Joy. This was also the point where I realised you can choose to grow the kid up immediately. And no toddler life stage? Whaa? 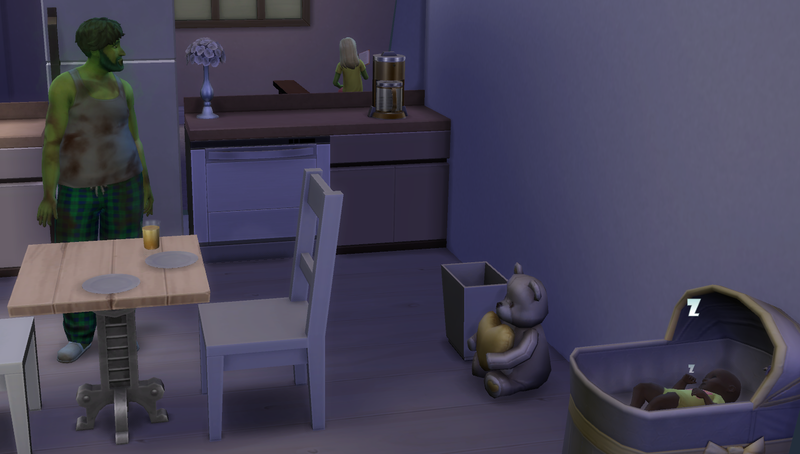 The toddler stage was so adorable, it’s a shame they shrunk childhood down to infant and ca. 8 year old kid. However you did need a lot of babysitting to take care of a toddler. I actually thought there was a learning potential for real kids playing through the expansive childhood stages in The Sims. Even young (prospective) mothers maybe? I.e. family life is hard work, parents have to put their own needs (and often career) aside to care for their children. Hey! In Sims 4, no need for that! You pop a child right out of that crib and the school will take them during all work hours! Eager to produce a spare heir, Nina being a real trooper went right on to incubate yet another little sprout. Babysister Jolene has very dark skin…? Out of the crib jumps Joy’s sister Jolene Jollygreen … who is very tan. Nina, did you happen to wohoo a little in a haystack or something? .. or no, that was Sims 3. I was really puzzled as to why Jolene came out this tan. Sims don’t just shag in back alleys and hedges by their own volition, this could only be a legitimate Jollygreen child. When I read Nina’s family heritage later on, it was the best explanation I could think of, despite how white Nina herself is. This also made me worried for the future of the green skin heir criteria. 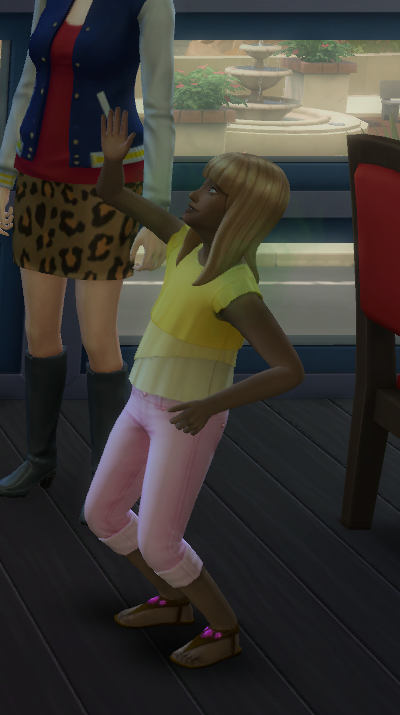 If every sim’s skin genetic is not just one factor, but two, green skin might be blended/shuffled out eventually, since the other half of the parent pool will always be a normal sim. A little research showed me that this is not the case with abnormal skin tones. Green will not blend but count as one factor, which should give me a 50% chance of a green kid. Phew! Lesson learned: Don’t waste time with keeping the babies in the baby life stage, force them out of that crib and straight into school! This entry was posted on October 4, 2015 by Ironyca in The Sims and tagged Computer Games, Generation 1, Generation 2, Papa Jollygreen, The Sims 4, The Sims 4 Legacy Challenge. Fun Browser Game: Can you get the 2048 tile?